Honeybee dancing is an intriguing topic. The dances of the honeybee are performed when a worker bee returns to the honeycomb inside the hive with pollen or nectar. These dances make up a language that tells other worker bees in the hive where the food is located outside the hive. By signaling both distance and direction with specific movements of the bee, the worker bee uses this language of dance to direct other workers on where to forage for pollen and nectar. Distance and direction of the floral source are told in two parts of the dance. Food sources that aren’t as close to the hive or are between 50 and 150 meters from the hive are portrayed to the other worker bees using the sickle dance. This dance is what could be described as crescent shaped and is a mix of the round dance and the waggle dance. The waggle dance is to convey that food sources are more than 150 meters from the hive. This dance not only tells the other foragers distance, but also lets them know the direction of the floral source. A worker bee performing this dance runs straight ahead for a short distance, returns in a semicircle to the starting point of the dance, runs again through the straight course, them makes a semicircle in the opposite direction to make a figure eight circuit (NY State University). While completing this circle, the bee’s body, especially the abdomen, shakes or wags vigorously from side to side (To watch the waggle dance check out this link: https://www.youtube.com/watch?v=aUCoLeI5Qxg). She also lets out a buzzing noise from her wings beating during the dance. While many variables in this dance refer to distance (dance tempo or duration of buzzing sounds), the most reliable part of the dance is the straight-run portion. As the distance to the food increases, so does the length of the waggle part of the dance. If the distance to the food decreases, so does the waggle portion of the dance. To help show the direction of where the food is outside the hive, honeybees will change the position of their dance. 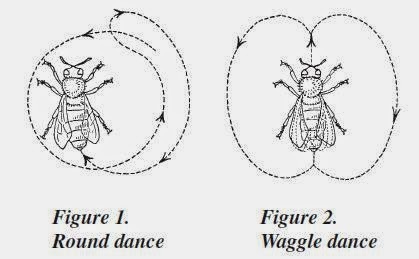 The orientation of the dancing bee during the straight portion of her waggle dance indicates the location of the food source relative to the sun. 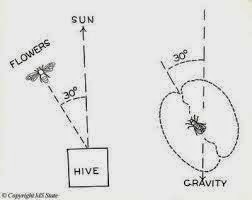 The bee takes the solar angle of where the food source is located and turns it into the gravitational angle to convey in the dance where the food is located. Since the sun changes place in the sky throughout the day, the bees dance will change throughout the day even for the same floral source because they use the sun to tell the other bees, using geometry, where the food is. 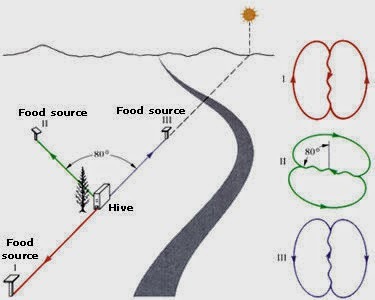 Therefore, if you want to know where the honeybees are communicating to forage, you need to know the angle of the waggle run and the compass direction of the sun, which depends on the location, date, and time of day. If you're interested in where I learned about honeybee communication, check outhttp://www.cals.ncsu.edu/entomology/apiculture/pdfs/1.11%20copy.pdf by NY State University andhttp://ag.arizona.edu/pubs/insects/ahb/lsn14.html by University of Arizona.